A daylong winter camp for children with disabilities was held near Bashundhara Eye Hospital in the capital’s Bashundhara Residential Area on Wednesday. 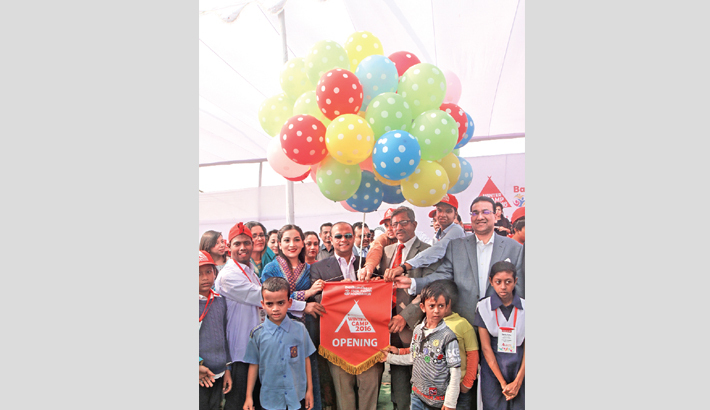 Bashundhara Special Children Foundation, a concern of Bashundhara Group, the country’s leading business conglomerate, organised the event styled ‘Winter Camp 2016’ in association with Bashundhara Paper Mills Ltd and SWID Bangladesh. Bashundhara Group’s Director Yeasha Sobhan inaugurated the event as chief guest by releasing balloons around 11:30am in Block-I of the posh and tranquil neighbourhood. Yeasha Sobhan said each and every family wants to build up their child as perfect human being. But, the hope turned as a matter of unhappiness if the child is physically challenged. “Special education is needed for the smooth growth of physically challenged children. I always extend my sympathy for the children with disabilities and I learned it from my mother. Taking inspiration from my mother, I took the initiative to establish Bashundhara Special Children Foundation,” she said. “This foundation has the arrangements of special education school and hostel for the special children. I want to stay beside these children for the rest of my life so that they can grow up as like my children,” she said. Yeasha Sobhan called upon people from all social strata to stand by the physically challenged children to help integrate them into the mainstream society. Bashundhara Group’s Vice-chairman Safwan Sobhan, BDG’s Vice-chairman Dilara Mostafa, SWID (Society for the Welfare of the Intellectually Disabled) Bangladesh General Secretary Zaherul Islam Mamun and other high officials were present at the event. Around 1,500 guests, including several hundred children with disabilities from different branches of SWID schools, participated in the programme, which included race, drawing competition, ball throwing and cultural events. The winter camp ended at 3:30pm with a prize-giving ceremony where Bashundhara Group’s director Yeasha Sobhan, BDG’s Dilara Mostafa and SWID Bangladesh’s General Secretary Zaherul Islam Mamun handed over prizes to the winners. Parents of the children with disability also attended the event. The guardians thanked Bashundhara Group for standing by the physically and mentally challenged children and hoped that the group will organise such an event every year for the special children.